PLC Medical Systems, Inc. is pleased to announce that Mark Tauscher, President & CEO of PLC Medical Systems, Inc. (OTCBB: PLCSF) will be presenting at our 10th Annual Small Cap Equity Conference May 7, 2013. 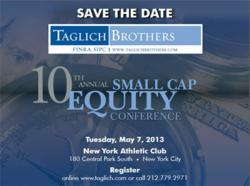 PLC Medical Systems, Inc. is pleased to announce that Mark Tauscher, President & CEO of PLC Medical Systems, Inc. (OTCBB: PLCSF) will be presenting at the Taglich Brothers 10th Annual Small Cap Equity Conference May 7, 2013. The Conference will take place at the New York Athletic Club, New York City. To request additional information or to register, contact Taglich Brothers at 212-779-2971 or visit http://www.TaglichBrothers.com. PLC Medical Systems, Inc. , the operating subsidiary of PLC Systems Inc. , is a medical device company focused on innovative technologies for the cardiac and vascular markets. PLC's lead product, RenalGuard®, significantly reduces the onset of CIN in at-risk patients undergoing certain cardiac and vascular imaging procedures. CIN is a form of acute kidney injury resulting from toxic contrast agents that occurs in 10% to 20% of at-risk patients. RenalGuard is CE-marked and is being sold in Europe and certain countries around the world via a network of distributors. Two investigator-sponsored studies in Europe have demonstrated RenalGuard's effectiveness at preventing CIN. The CIN-RG RenalGuard pivotal study is underway in the U.S. to support a planned Premarket Approval filing with the U.S. Food and Drug Administration. Additional company information can be found at http://www.plcmed.com.